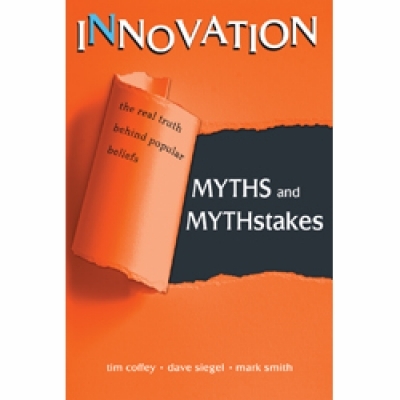 "Innovation Myths and Mythstakes (mistakes) by Tim Coffey, Dave Siegel, and Mark Smith"
How to develop a winning new product innovation program. Many myths and "mythstakes" (truths that have been misapplied) held by today's businessmen and innovators have made the job of innovation even more difficult and riskier than it needs to be. Myths about failure rates, finding opportunities, ideation, what is needed, how to get great performance, and many more. This book will help you understand the roadblocks and challenges of innovation, and how to overcome them. Once the myths are debunked, you will be on your way to becoming a better innovator. Myth #1 80 percent of all new products fail! Myth #2 The ROI on innovation is terrible. Myth #3 Don’t bother unless it’s perfect. consumer (a.k.a. The Consumer Is King). Myth #7 There is a secret on how to be creative. are best staffed by “fresh” consumers. Myth #9 Only “right brainers” are creative. Myth #12 There is no such thing as a bad idea. Myth #13 Great Ideas will make you rich. Myth #14 A great idea speaks for itself. will beat a path to your door. Myth #19 Facts convince people to buy. Myth #20 BASES testing will show the way. Myth #21 It’s not worth doing if it’s not invented here. Myth #22 R&D should lead the way. Myth #23 You don’t need a process to innovate. Myth #24 Stick with the plan, no matter what. Myth #25 Innovation means never looking back. Myth #26 You have to please your audience. Myth #27 We’ll innovate when we need to. Special Offer: Order with BrandAbout by Andrea Syverson and save an additional $20. See ordering option above.